Stand by your man, Give him two arms to cling to, the 1968 song by Tammy Wynette asserts. 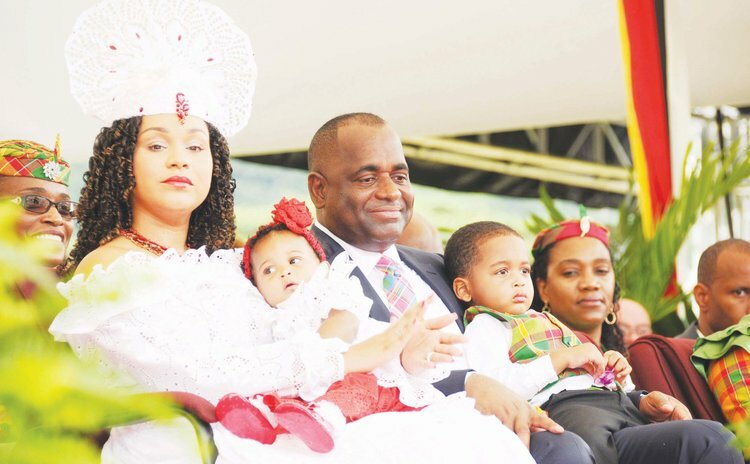 Last week Melisa Skerrit did much more than stand by her man- she raised her voice to hoist her husband, Prime Minister Roosevelt Skerrit, closer to the level of deity. Speaking last week at a welcome-back-home ceremony organised by the ruling Dominica Labour Party (DLP) at the Douglas Charles airport, after Skerrit received an honorary degree from a University in Pennsylvania, Mrs. Skerrit said Prime Minister Skerrit is remarkably altruistic. "When you suffer, the Prime Minister suffers with you; when you are in distress, the Prime Minister feels your pain," she said. "My friends, our Prime Minister is now at the forefront of the fight against climate change. Resiliency is now his mantra. "Our visionary leader catches the attention of the world. When he speaks, on our behalf, the world now listens. "The Bible speaks about giving honour to whom honour is due and I ask that you join me in congratulating him. With this second doctorate the Lord is showing us that His mighty hand is still upon His appointed leader. "I am blessed to be married to this man who covers everything that I asked God for, a loving man, a hardworking man, a God-fearing man. "His unwavering devotion to his family is matched to his dedication to our nation's children, the elderly, disabled, the sick and the shut-ins." As part of its campaign in preparation for the next general election the ruling DLP has been revamping the image of its leader, Prime Minister Skerrit, as the party has done continuously during, before and after election campaigns. In 2014, for instance, the party's slogan was "Leadership is everything." Last week it was announced that Prime Minister Skerrit received an honorary doctorate, on October 16, 2018, from the Duquesne University in Pittsburgh, Pennsylvania, in recognition of his leadership and advocacy on climate change. In February 2016, Lovely Professional University of India conferred the Doctor of Letters degree on Skerrit "in recognition of his desire to build international harmony among nations and for his outstanding public services and excellent governance".